Was Sean Spicer lurking in - or only around - the White House bushes on Tuesday night? This bizarre question is currently consuming the Washington Post, half of Twitter, and very likely Donald Trump's press secretary himself. It follows an article describing the scene at the White House grounds, as news broke that FBI chief James Comey had been fired. A phalanx of reporters waited to hear the president's line on the bombshell, and - according to the Washington Post - press secretary Spicer was seen "huddling with his staff in a clump of bushes". The president's spin doctor later appeared "speed-walking up the White House drive" to defend his boss, and insisted on briefing reporters in near-darkness, without being filmed. When the world awoke on Wednesday, many Republicans were uneasy, and outraged Democrats were calling for a special prosecutor to investigate whether the Trump campaign colluded with Russia to influence the US election. But someone at the White House obviously had time to take issue with the wording of the Washington Post's colour piece. ... and a tweet, in case anyone had missed the editor's note. Was it a wry swipe at a non-issue, or a serious clarification? Either way, the correction sparked amusement on social media. Buzzfeed journalist David Mack unearthed a photo of a giant rabbit posing between George W Bush and his wife, Laura, which instantly went viral. Remember that Mr Spicer used to be the man tasked with dressing as the Easter rabbit during the Bush years. The US book publisher Melville House tweeted an emoji spin on the saga, featuring multiple shrubs, a faraway video camera, and the "monkey hiding his eyes" emoticon. 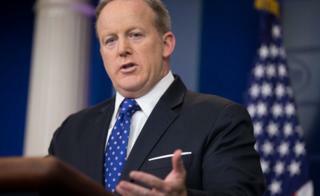 Others suggested the small matter of a preposition could not harm the Zen of a man like Sean Spicer. As one law student and tweeter put it, "he is one with the bushes".